In between meeting David Suchet and attending the Verdi and Wagner concert I also attended the 20th Collectormania event at the Milton Keynes Dons Stadium which was held over the weekend of Friday 15th – Sunday 17th November. This was the second Collectormania event of the year with the first being back in May, and for me this was my second time attending this event (I first went in May of this year). Collectormania does not charge an entry fee which I think is brilliant. For those who are new to signing events Collectormaina is a great introduction as well as highlighting what ShowMasters have to offer. Collectormania is exactly as described; you meet the stars from film / TV and you have the opportunity of obtaining their autograph or having a photo shoot with them. It’s been some years since they have held two events in one year due to it outgrowing the MK shopping centre but already ShowMasters have planned two for next year. The event was slightly different compared to the one held in May. Previously the event was held on the concourse around the stadium, you could walk around the stadium meeting the guests, looking at various stalls and there was a dealers room with a limited amount of merchandise. This time around due to building works going on at the stadium, the event was held in what I thought was a basement but I have now found out it will become a hall. It really did feel like a cold and damp basement though. The hall was still a work in progress with wires coming out of the ceiling and scaffolding on the upper levels. This is did not deter people from attending though. In previous years the event use to run over bank holiday weekends and take up three full days. While not being a bank holiday the event did run over the entire weekend however, I only attended the event on Saturday and Sunday. Compared to May what really stood out for me was the increased volume of dealers /stalls selling all the usual amounts of film and TV related merchandise. In many ways it was exactly like being at LFCC with the stalls in the centre of the hall and all the signing tables around the edges. The layout was a little confusing with some signing areas in awkward corners or bottle necked. For example I witnessed this where David Prowse was signing; at time you could not move and the whole area was blocked. There was one area where the Milton Keynes Garrison was based (a Star Wars group) and I didn’t even find it till Sunday. It was right in the back of the hall. There was some confusion over queuing with those wanting autographs getting in the way of others guests but these were easily sorted out. I would be remiss if I didn’t mention how cold it was over the weekend. It was freezing and I did see via Twitter a picture of one of the guests all wrapped up on the Friday due to the extreme cold. I am not sure what could be done to avoid this apart from not having an event in November or supplying a lot of portable heaters. All I can say is thank goodness for tea…. The guests for Collectormania included: Connor Trineer and Dominic Keating from Star Trek: Enterprise, Colin Baker and Paul McGann from Doctor Who, Lew Temple from The Walking Dead, David Bradley from Doctor Who / Harry Potter, Iain Glen from Game of Thrones, Fintan McKeown from Games of Thrones / Voyager and many, many more. It only took me five minutes after arriving at the event to make my first purchases. I did say to Laura that I was determined not buy anything straight away but the chance to buy some DS9 comics from 13 years ago was too much for me. From there my spending continued. 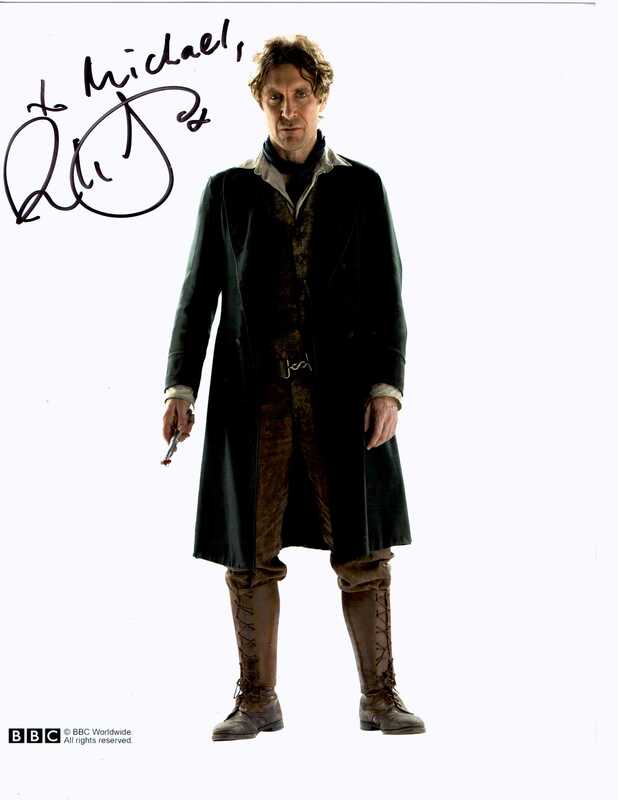 After the amazing eight minute Doctor Who mini-episode “The Night of the Doctor” with Paul McGann I was in two minds whether to have a photo shoot or to simply get his autograph. I decided to get his autograph and am glad I did. Paul was really friendly; he shook my hand and asked how I was. I mentioned that after the seeing the episode we had really missed out by not seeing more of him as the Doctor and his reply was he had missed out too. I think at the next event I will get a photo with him. Over the weekend I had two photo shoots. 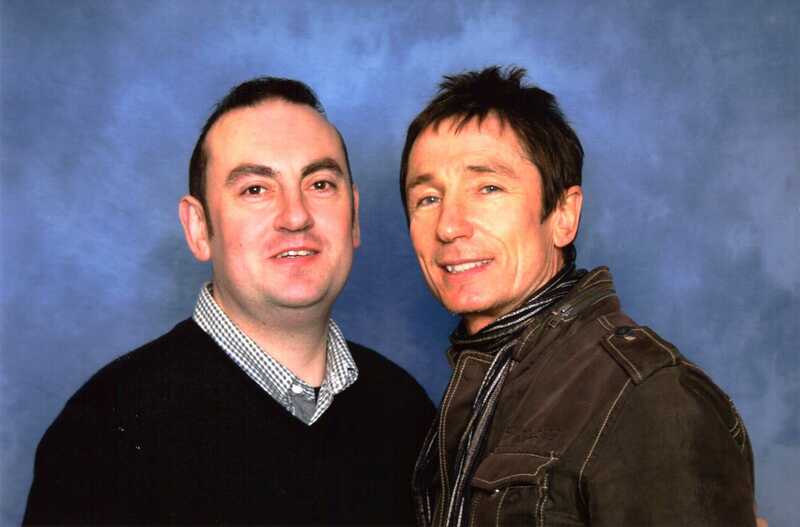 The first picture was with Connor Trineer and the second with Dominic Keating. It was ironic really since I am not a big fan of Enterprise and even less of a fan of Trip Tucker. However, I don’t hate Enterprise so it was a nice chance to meet some more Trek stars. They were both very pleasant. I also decided to get their autographs but instead of individual pictures I purchased a cast photo. My mission now is to try and obtain all the autographs of the cast. Bunny has already mentioned this could be mission impossible but I am going to try. Compared to Nicole and Garrett; Connor and Dominic were not as chatty (well to me anyway) but they were very popular over the weekend. I also managed to get a cast picture from Into Darkness. This particular picture had been used on the cover of Empire. Now that would be an amazing set of autographs to collect over time. I think if the new crew were to start attending cons then I think I would consider collecting them all. Over the weekend I managed to have my picture taken with quite a few people dressed in all types of wonderful costumes including the second Doctor, Magneto, a Dalek and of course Starfleet uniforms. While I really liked my photo shoots (still some work needed on my stance) the best picture of the weekend was one where I was being held at gunpoint by an Imperial Officer. Vicky is part of the Milton Keynes Garrison and I enjoyed our chat about Star Wars, Star Trek and J.J’s involvement with both. 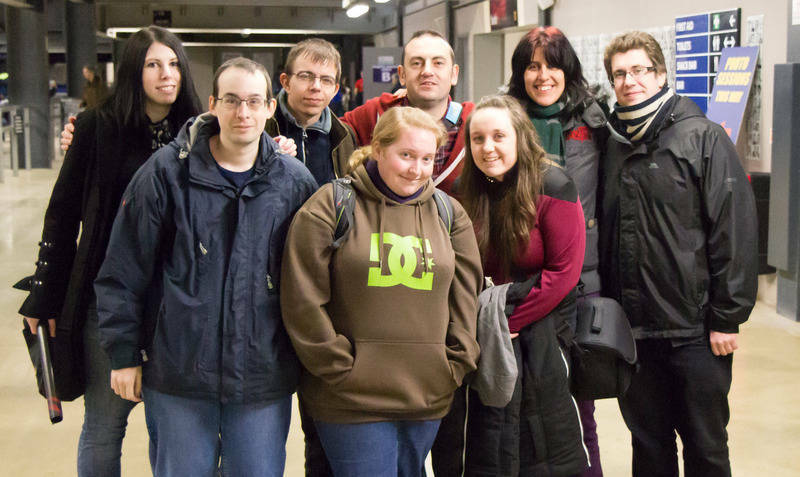 I was really looking forward to attending the event since I would be catching up with Bunny, Laura, Matt, Jon, Gaz and for the first time would be meeting Rebecca and Zoe whom I have become friends with on twitter. It was nice to catch up and to see how everyone was doing. We had a meal on Saturday night which was great fun, and on the Saturday we took a wonderful group picture. It was really nice to see Laura meet Fintan McKeown who played Michael Sullivan in the Voyager episodes Fair Haven and Spirit Folk. The excitement on Laura’s face was priceless and it was nice to share that moment with her. 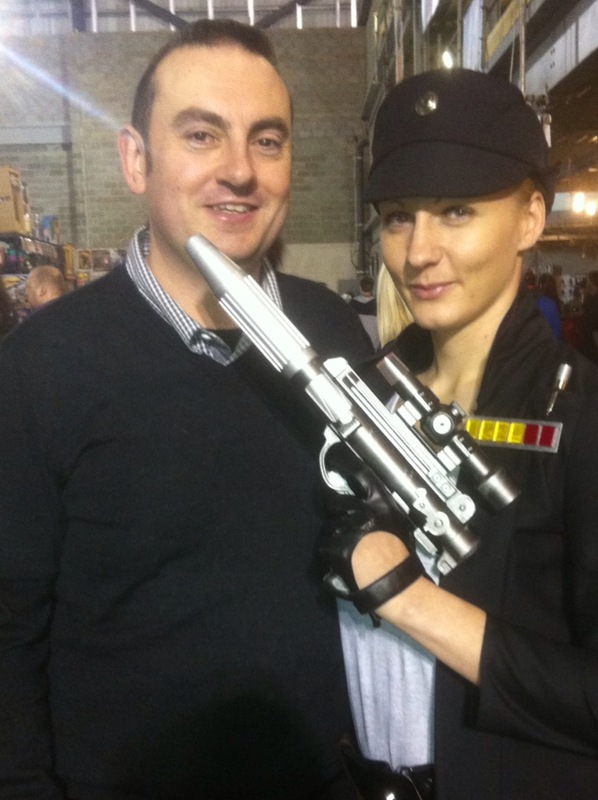 Collectormania was an enjoyable event. Yes, it was incredibly cold but even taking that into consideration it was a good weekend. 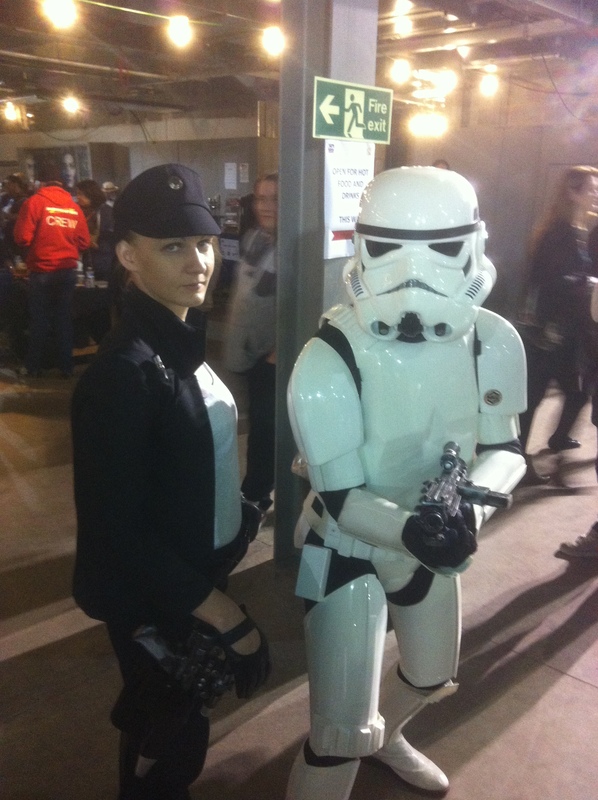 I met a Time Lord, managed to get arrested by the Empire and made some new friends. Thanks to Bunny for her support and patience with this piece.